First Lutheran Church in Williston, North Dakota is a thriving community that seeks to live out God’s word, and as such First Lutheran Church has a long tradition of outreach and service. Your presence at worship would be a delight to our eyes so together we may dwell richly in the presence of God, and each other. By the power of the Holy Spirit we are nurtured by Christ's action in the cross for us, so that we may serve others. Believing in God’s abundance for us we are a thriving community that seeks to live out God’s word, and as such First Lutheran Church has a long tradition of outreach and service. Your presence at worship would be a delight to our eyes so together we may dwell richly in the presence of God, and each other. We look forward to seeing you Wednesdays at 6:30pm or Sundays at 9am or 11am. First Lutheran is proud to present our Online Giving Program! You can effortlessly give to First Lutheran using this program. 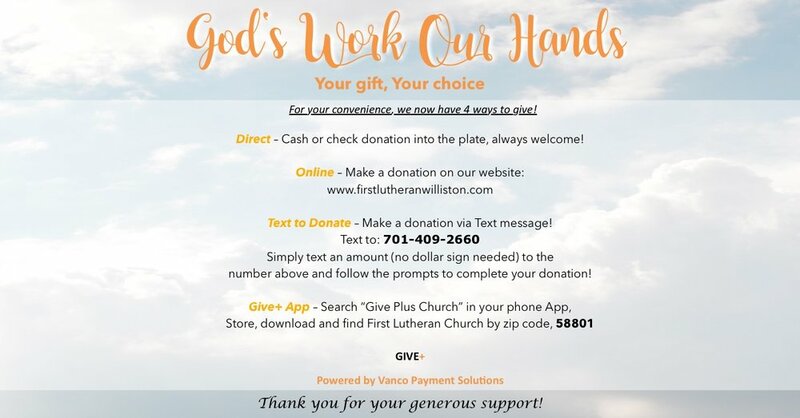 All you have to do is follow the link, and you can provide recurring funds or just a one time payment to First Lutheran to assist us as we continue our mission of getting God's word out! Please consider doing so! We are grateful for everything you do and appreciate all the support you give us! We have our Tentative Confirmation schedule and Youth and congregational Life Activities schedule ready for the 2018 - 2019 year! We want you to stay prepared for the upcoming year and be a part of all of our ongoing activities. You can download them by clicking on the buttons below. Register your child for Sunday School! Sunday School will officially began September 9, 2018 at 10AM. Download the form below, fill it out, and turn it into our office at the church!